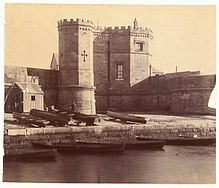 Fort Macquarie on the banks of Sydney Harbour was built in May 1798, just ten years after the First Fleet arrived. An important part of our heritage it was demolished just after it’s 100th birthday to make way for a tram depot. The Fort Macquarie Tram Depot was built in 1901. In spite of being an important part of the heritage of Sydney it was torn down in 1958 to make way for a theatrical venue. In 1959 construction of the Sydney Opera House began on the site of an old tram depot. It opened in 1973. In 2003 it was listed in the State Heritage Register of New South Wales. It made the National Heritage List in 2005. I think the Sydney Opera House is fantastic. I would never suggest that we demolish it. However I do find it ironic that if todays standards of heritage protection had existed in the past then this iconic building that is recognised around the world as a symbol of Australia and of Sydney would never have been built. Todays heritage required the destruction of the pasts heritage. I wonder what other world class constructions we are missing out on because we have become fascinated with preserving the past. If it were possible to wind back time would we give up the Sydney Opera House to preserve Fort Macquarie? I currently watch in some bemusement as a line of government buildings claw their way up the hill here, each replacing a building further down the hill that despite being about 30-50 years old, is heritage listed. My local Council recently wrote to ratepayers announcing grants for preserving heritage properties. I wrote and protested at using my rates to promote one style of construction from the past ahead of other styles from the past or contemporary styles. I expect they won’t even know what I’m talking about. Heritage is a bit like ‘sustainable’ – you’re supposed to know what it means. It will slowly turn into a giant decaying shithole. I think the core problem is lack of land-substitutes. I think we need to meet Henry George halfway, not by cranking up any land tax, but simply by nudging things within our current setup to bias towards the over-production of land-substitutes. That way heritage issues wouldn’t seem so pressing. If “LAND” as-it-were ……. (and to speak paradoxically) ….. was always oversupplied in any given locality. A good initial reform of heritage laws (short of scrapping them) would be to insist on some age criteria. No additional buildings should be added to the register unless it is over 100 years of age. That should slow things down a bit and ensure a number of heritage officers became redundant. The point being to slow down the heritage “industry” without the difficulty of arguing that nothing should be listed. The next step beyond that would be to require that no private property should be listed without just compensation.